Update (3/29/14): I’ve written up an analysis of national tuition cost trends in a new blog post. It turns out that Michigan State University’s tuition situation isn’t uncommon! What we see is a startling trend: Modern students have to work as much as 6x longer to pay for college than 30 years ago. Given the reports that a growing number of college students are working minimum wage jobs, this spells serious trouble for any student who hopes to work their way through college without any additional support. Let’s crunch a few more numbers to see what a typical year would look like for a student in 1979 and 2013 working her way through college. Most students take 12 credit hours per semester and only attend Fall and Spring semester. That’s 24 credit hours per year. The 1979 student would have to work about 10 weeks at a part-time job (~203 hours) — basically, they could pay for tuition just by working part-time over the Summer. In contrast, the 2013 student would have to work for 35 ½ weeks (~1420 hours) — over half the year — at a full-time job to pay for the same number of credit hours. If you’ve ever attended college full-time, you know that this is basically impossible. Perhaps it’s no surprise that tuition costs are rising, and college is becoming less and less affordable by the year. Yet somehow, the idea that we can work our way through college still persists. This ethos seems to be the latest generation’s version of American Dream: If you work long and hard enough, and if you sacrifice enough, you will eventually graduate college without debt and land your dream job. But with the way this trend is going, it looks like even long and hard hours at work won’t even pay off any more. In short, I’d like my readers to walk away knowing that it’s not nearly as easy to work your way through college as it used to be — stop telling us to do it just because you did a decade or more ago. * Note about the data: For the minimum wage data, I set the minimum wage to the maximum for the year, even if minimum wage was raised in the later parts of the year (e.g. September). For the tuition data, I averaged the Fall and Spring tuition rates (if available), and only used the tuition rates for students admitted that year. I dropped any entries for Summer tuition on the assumption that most students do not attend Summer semester. Did you take into consideration that pre-1992 a typical MSU student would be on the trimester, i.e. they would take three semesters of courses per academic year? The institution has also managed to climb higher in the global rankings, and is now considered one of the top 100 research universities of the world – not a claim that could be made several years ago. That’s a fair point about MSU becoming one of the top 100 research universities in the world, but I don’t think this observation is limited to MSU. I’ll have to do more digging to find this kind of data for other universities, but I bet we’ll see a similar trend. Really awesome graphic. I think this definitely gets to the crux of the issue, and as someone who only worked 20 hours a week part-time through college I can say it definitely took its toll. That was just for rent. MSU’s rankings is a moot point. As you said, this trend is likely consistent over different universities. Really cool stuff. Working your way through school is a good idea on its own merits. It involves making adult decisions – such as what you are capable of affording – and living by them. Do I think public colleges and universities should make every attempt to be affordable? Absolutely. But I also encourage you to work your way through school – it’s a good opportunity to grow up. It is a luxury to have the choice, dude. I would love it if we could compile similar historical tuition data for other universities across the US. If anyone finds some, please link it here (or email me)! My twitter page has the national tuition rates as measured by minimum wage hours worked (1971-2013). I can get you state by state, but that will take a little longer. 40 years ago you could work your way through private instiutions – now, not so much. See my updated post about this. I ended up looking at national data and found the same trend. Hey Randy, I wasn’t there to hear your grandpa’s points so I can’t say I agree with him. When I hear “work your way through school”, it doesn’t mean to be debt free by the time you graduate. The minimum wage has never been enough to pay off college. You take out school loans and pay them off with the higher wages you can make with a degree. There’s no debate that the cost of college has increased dramatically and more debt is inevitable. To me “working your way through college” means you are employed and paying toward your college costs. You are going to work in the evenings instead of going to parties. (This is not to say you can’t have any fun.) You are taking on the responsibility of paying for college and not expecting your parents to cover the costs. “Working your way through college” builds character. If you’ve had something in your life build character, then you know it is never easy or fun. It was a great feeling to pay off my last school loan. The fact that it took me 10 years to get there made it that much more rewarding. Maybe your grandpa wants you to take the path that will build character into your life. If you do that, then he can die knowing that you are taken care of. However, one thing I do know is that my grades suffered because I worked through college. Some semesters I had to drop classes, or did poorly in classes, because I simply didn’t have the mental energy to put more time into the homework or study for the exam after working for 20+ hours and going to my 4-5 classes that week. That translates into a lower GPA upon graduation, which ultimately devalues my degree. I also took 5 years to graduate instead of the usual 4, which is one less year I could’ve been working full-time in my chosen career. I know I’m not alone in this as well. I took 6 years, and grades suffered – failed a couple of classes, dropped a semester, and ended up with a … 2.8 GPA (the 0 and 1.5 really bring down the GPA!) I had a bit of help from my parents, and ended up taking a loan the last year, and even then, I was working an off-campus job, and one or two on-campus jobs, which either paid directly or applied a stipend to tuition. I think I was doing about 20 hours per week of ‘work’ in addition to 12 credit hours most times, and it was tough. And I still ended up with some debt, just not a crippling amount. This is why I think there would be tremendous value in spending time in high school highlighting careers that don’t require college degrees but can still be lucrative. The trades, truck driving, etc. all pay well and don’t bankrupt you with the training. I have to agree with you on this point. It goes back to schools using “Tracking” as a method of putting certain kids into trades and others into college prep. The problem was activists felt it was being used as a method of keeping poor or minority kids out of college, so it became a dirty word in educational circles to use “Tracking”. Those programs used to put out qualified tradesmen, and now barely exist. We as a country have become so afraid of looking bad by tracking the wrong kid, that we gave schools no other option but to encourage college, which isn’t tenable for some kids financially or academically. The perception of unfairness, and parents natural inability to be honest and believe that their child may not be college eligible will complicate this issue for a long time. The real losers become the kids who are pushed into a college track they are not ready for nor can afford. I’m still struggling to graduate now. I work 35-40 hours a week outside of my classes and school work and I can honestly say this has a serious negative effect on my grades. Most of the time I’m just too tired from my crazy weeks to do any homework when I get home from work which makes doing well in my classes extremely difficult. I’m also going on my 5th year due to transferring and dropping too many classes that just got away from me due to my schedule. I feel like this financial burden is killing me sometimes. Did you read the chart, Tim? You say that, “The minimum wage has never been enough to pay off college.” But It’s pretty clear, given the data above, that in 1979 (up until 1995ish) it was pretty feasible if not downright easy to cover the cost of tuition with a part time job. College should be more affordable. I suppose what I’m getting at is that your BS about building character is just some line that’s been cooked up and passed around to make you and others feel okay with taking on massive loans for higher education. Hey, I appreciate all of the responses and it’s great to see so many different perspectives. I attended South Dakota State University which the annual cost of schooling today is $14,460 (SD resident) and $16,530 (Non-Resident). This cost includes 15 credits per semester, room and board. I guess I couldn’t afford to go to a more expensive school. Here a link to the cost estimate if you don’t believe me: http://web.archive.org/web/20110802000711/https://www.sdstate.edu/admissions/financing/undergrad/cost/. My parents had a combined income of $14,000 per year so the cost to go to school seemed pretty expensive to me. I guess I really can’t relate with students who have parents that can afford to help with their schooling. Working and going into debt weren’t really a choice for me. I either went into debt or didn’t get a college education. What I will say is that there are schools out there that are more affordable. Going to a more expensive one is a choice you are making. I’d call the school you went to expensive, from what you’re saying. Certainly for you, as you note. And I think that underscore’s Randy’s point – if you want to go to college, you have to go into debt and/or get parental assistance whether or not you work. Forget minimum wage. I work a full time way above minimum wage and two things make it hard for me at school. a) tuition is a beast but at least my job as some reimbursement – though it pays for a semester 6 hours. b) the school barely has any classes geared towards someone who works. I know I could have gone to school at a technical school I did that years ago and I don’t recommend it. I went back over 5 years ago and did community college first. I received my Associates and that allowed me to transfer right into a four year institution as a junior. But every class that I need now about half are never taught until after 10:00 am and before 3:00 pm. Guess what I have to be at work for my job. Now my company supports me going to school but its almost like the school doesn’t support me going to work. They state they have an Adult Ed center where I can get help but guess what it closes at 5:00 pm?!? I don’t understand how you are supposed to have an AE center to help people who work but then you are not open to help them when they need it. I almost feel penalized for not working at night but how can I give up (and really why should I give up) working at a great job. The school states that they have more evening classes for the Grad students but what about us Undergrads don’t we need evening classes? At least back in the 90’s (when I should have been in school), and in CA, I could have taken every Undergrad course at night. It would have taken me 6 – 7 years to earn a BS in Computer Science now I’m on year 8 and I still have a couple years to go at this rate. Why am I being penalized? is the real question…oh and I’m earning straight A’s and I’m on the Chancellor’s/Dean’s list. But it doesn’t make sense to me. I think the calculus is pretty clear. It would be much more cost effective to take more credit hours per unit time and completely forgo a job than to take a minimum wage job while in college. This allows you to finish college more quickly (and start earning) as well as minimize the non credit hour based expenses of college (housing, food, etc. ).What this says about the minimum wage or the cost of college I will leave to the reader. This is a good thought but has anyone done the analysis of the overall cost of doing so long term? ie. is it cheaper to borrow, or work? Are there long term financial savings to cramming the course work in a shorter time span even if you need loans to do it? I haven’t performed any analyses of this, but I’d imagine it’s better in the long term to work through college as quickly as possible. Even if you can’t get a job in your field immediately out of college, you’ll undoubtedly make more as a college graduate than as a college student (who are notoriously underpaid). I had a regent’s scholarship for full undergrad tuition. I had merit scholarship $1000 per year undergrad. I worked from junior year on about 22 hours a week. I did it in the last 5 years. I worked part time in the first year of my degree, full-time in the second year and 30 hours plus extra freelancing in the final year. I’m in the UK, so the financial calculations aren’t comparable, but I share my story just to show that it’s perfectly possible to work through university. The key to success in my case was to take jobs that were closely related to my degree. The degree was biology, my first job was as an ecologist, second as a researcher in a government lab and the freelancing was iOS development. All of those contributed skills that made me better at my degree. I missed almost all the lectures after the first year, but I got one of the highest final grades of my cohort and am now doing my PhD. Of course doing a job for minimum wage is not worth it, but by the time you’re at university you have skills worth much more than that. And you ought really to have ended there, before the ‘but’. There’s no comparison at all worth making, in terms of the finances or the availability of jobs. Just be thankful that you (presumably) have funding for your PhD, and won’t need to take out a six-figure loan (or code the next Flappy Bird) to cover its cost. IT is also important to note in the UK employers recognize that university students have skills worth much more than minimum wage. In America, college students might be lucky to find something that pays $12 an hr in an area where the costs of living is much much higher. And employers in America limit the number of hours employees can work. The US is a different beast. I am about to do a PhD in the UK. I told my mom I would job hunt the first semester I am there. She thinks the job market is just as horrible in the UK as it is in the US. It is bad in the UK I understand that, but with a MS degree, work experience I have and the languages I speak. I know I’ll be fine. Hell, I don’t even have to pay rent when I get to London (crashing with a friend). But all in all I think we all have our realities. As the other guy said. You should stop right at the sentence stating that the finances don’t compare. Once you realize it’s much more affordable to pursue a degree in the UK and work on the side. It’s a different story. In the US, college students have to work for minimum wage. In the US college graduates are also competing for part-time minimum wage jobs. Last year in the US those were nearly the only types of jobs available for graduates let along the students themselves. The US has higher inequality than the UK does. The US has lower social and economic mobility rates than the UK does. The US is trying out feudalism for the first time. No amount of hard work will get you anywhere in the US if you don’t get that first break. And most do not get that break that’s needed to get ahead. You could also go study in a country that invests tax payer money directly into universal access to education. Most of north west Europe except England and Wales have accessible education systems. Not sure how welcoming those countries would be to a bunch of US students wanting to come there for a free education. 🙂 Isn’t free education generally limited to natural citizens? I just hope that one day american youth will wake up and demand public high-quality education. What you want to do with your life is tied with what you need to study, and money should not be put in that equation. American youth is already demanding public high-quality education – that’s what part of the Occupy protests are about, as well as a bunch of other youth activist movements across the country. The problem is they/we don’t currently have the institutional power to make it happen. That site claims a moderate cost for a year of public college education comes to $22,826, around 3,150 hours of minimum wage work, or about 78 weeks of full time employment at that wage point. Multiply that by 4 years of college, that comes to a pretty even 6 years of work, full time, at minimum wage, to afford a degree, assuming you had absolutely no expenses whatsoever for those 6 years. While tuition costs overall are vastly different here in Canada, it seems like tuition at MSU is pretty similar to the university I attend, maybe even a little cheaper. I think the key as a student is that you can do a lot better than minimum wage by working in various academic jobs. Undergraduate teaching assistants at my university earn $22/hour, which is double the provincial minimum wage. During the summers (and sometimes in the school year proper) you can get student research scholarships which also pay well, often enough to cover a year’s worth of tuition. Of course, there are a lot of variables involved; I’ve lived at home through my whole degree, and probably wouldn’t have earned enough if I’d had to pay for food and rent. My degree is in a research-oriented social science, where these sorts of jobs are available, which might not be the case for everyone (I don’t know if business school professors ever hire student researchers, for instance). Our department is quite small, so I’ve been able to get to know my professors and convince them to hire me. Starting to make myself known in first year helped me to stand out, too. And I saved up several thousand dollars by working through high school, which gave me a buffer I could rely on if my summer jobs didn’t cover my costs. Anyway, despite all the caveats, I wanted to make that point. Since the funding for academic jobs typically comes from federal grants or from the institution, you can do really well if you ask around. There’s no undergraduate TAs here making $22/hour, and I go to a wealthy university in an expensive American city. That’s more along the lines of what graduate teaching assistants make. And graduate administrative assistants make $14/hour. I’ve seen undergraduate work-study and general employment advertised on campus and they’re typically offered around $10-15. I think it’d be very difficult for a student on the U.S. to get any kind of part-time job that was going to pay them more than $15/hour, and even that would be a lot. Also, undergrads usually don’t get paid for being RAs here; they typically volunteer for the position for course credit or a letter of recommendation to use for graduate school. And here in the States, you can’t get a research scholarship that will cover a year’s tuition. Our summer REUs usually pay around $3000-4000 at most – there are few colleges in the country where you could cover the entire year’s tuition with that. And students from those schools generally aren’t competitive for the well-paying summer REUs anyway. On the flip side, I’d like you to recognize that trying to combine about 6 different variables into a single line graph is a huge oversimplification which tells one particular story. For example, how many people work through college on minimum wage jobs, who cannot get better jobs? My second semester at school, I got a job using my field of study (art history) making 50% more than minimum wage — and I assure you it was not because of my intelligence, grades, or appearance. That leads me to look at where your data is coming from, and the first thing that sticks out is that it’s for Michigan State University. (I did not go to MSU, or a school anywhere near Michigan.) What is going on in the once-proud state of Michigan, that when presented with an army of 50,000 young people looking for work, that employers might only looking to pay them the absolute minimum (which is barely above the federal minimum)? That in turn leads one to discover that Michigan has one of the highest unemployment rates in the country — and also one of the highest crime rates, sadly. Michigan State University isn’t tough on students. Michigan is tough on everybody! It’s simply a lousy place to live. Let’s call a spade a spade. The Michigan economy is terrible! Don’t extrapolate “MSU students” to “students”, when the correct extrapolation is “MSU students” to “people living in Michigan”. I’m currently in the process of collecting data for other universities, and from what I’ve seen so far, it’s not uncommon to see the tremendous rise in tuition costs that we see at MSU — especially in the past decade. While I agree that more data needs to be collected before a blanket statement can truly be made, I haven’t seen any data yet indicating that the trend I reported on here won’t hold nation-wide. That’s how regression analysis works, though. You use several different variables to try to make an imperfect-but-close prediction of trends, which inevitably leaves some things out. But yeah, I think it’s pretty accurate to assume that most college student’s aren’t making much more than twice the minimum wage, and even if they are, (10 hours x $15 x 34 weeks) + (40 hours x $15 x 16 weeks of summer) is still only $14,700, which isn’t enough to cover the average cost of attendance (around $28,000 at public colleges/universities). http://www.sdstate.edu/admissions/financing/undergrad/cost. It can be affordable if you choose to. The x-axis also represents time well, since median household income has consistently gone up over time. What we see is a clear correlation between the median household income and minimum wage. This lends support to my theory that wages track well with minimum wage. Lacking data on actual student wages, minimum wage thus represents a reasonable alternative to discuss relative hours worked to pay off tuition over time. Minimum wage is still a better measure to use, even if median wage and minimum wage did not correlate well at all. After all, how much can we expect 18-21 y/o full-time college students to get paid in hourly wages. My guess is that it is much closer to minimum wage than median wage. I generally agree with what this linked page says, but it makes me wonder: Has state funding actually decreased, or has the university’s overall budget increased (thereby making it appear that state funding has decreased when shown as a %)? 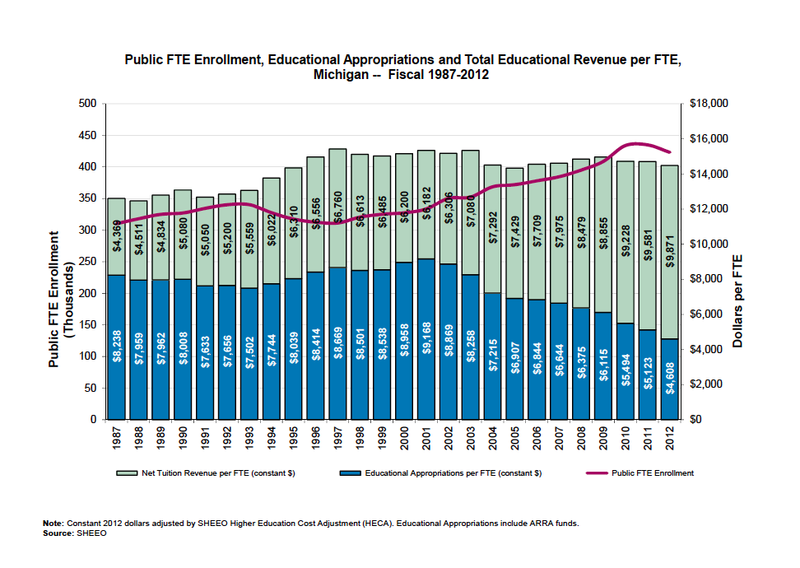 I work for University of Michigan, and can confirm that the state has made serious cuts in education funding. In Illinois, it is a little of both. They experiences several years of budget growths during the “good” years in the early 2000’s and at the same time the amount of state funding was decreased annually by the legislature. Furthermore, amongst this as budgets tightened the state has reduced aid eligibility and maximum awards as tuition has increased. Its a confluence of events here that other states are grappling with as well. I graduated in 1969. My tuition that year was $400. The minimum wage at that time was $1.85/hr. Premium gasoline was $0.10 per liter (equivalent). Now gasoline is $1.45 per liter or 14.5 times as high. Pretty much every thing else has gone up by about the same factor due to inflation. Minimum wage should be at least $26.80 to have kept up with inflation. The cost of everything has gone up faster than the minimum wage including the wages of the university professors, so it is no surprise to see your results. Please see this comment about minimum wage correlating strongly with median household income. I’m using minimum wage as a proxy for how much students made while working at the time, with the assumption that most students make within 1-2x minimum wage. It’s because people take loans out that are guaranteed to get paid in full by the government. It means that there is very little competition for a students money which drives up the cost of tuition in an uncontrolled fashion. It’d be interesting to see a comparative graph and data for say a community college? Has the cost per credit our at a place like Lansing Community College mirrored the rise at MSU? This article is so well thought out. Its about time someone said it and killed the myths out there about the “pull yourself up by your bootstraps” method of college finance. Not to brag or nothing, but I was making $19/hr as a college student working part time in 1999. Considering gas was $1/gallon and tuition was $3800/year I guess I was living the good life working 30 hours a week and taking a full engineering course load. My rent was $150/month and my car was $1900 (bought used). Oh yeah, no cell or laptop either. My only mistake was getting married my senior year. Now I just pay alimony and have nothing. Here’s the plan to earn your 4 year degree w/o student loans: start working while a young teen, saving that money towards your college education–part time during the school year, full times during summer. Go to a community college for your first 2 years of basic pre-requisites while working full time/paying for classes. Maybe it will take you 3 years instead of 2 years but no debt. Then, transfer to university, and continue to work .Again, it may take an extra year. It is entirely possible to work full time and carry a full load at university. It isn’t easy but it is doable. Much better than carrying student load debt, imho. What job do you expect a young teen to get that is going to get anywhere near doing anything. When I was 13 I was a little league umpire, but I couldn’t start working even (or especially) landscaping work until I was at least 16. When I turned 16 I worked for 30 hours a week or so as a busser then a line cook. I can tell you this: that money didn’t do anything towards my student loan debt. I went to a prestigious private school (with some scholarship money), and while you may not feel sorry for me—I certainly don’t—there isn’t a damn thing I could have ever done to even dent my student loan debt. “It is entirely possible to work full time and carry a full load at university. It isn’t easy but it is doable.” As a college professor, I beg to differ with you on this point. The students I see who work any more than 20 hours a week don’t do well. Their grades are often horrible, they drop classes left and right. . .it’s simply not tenable to work full time and go to college full-time. I tried taking an accelerated summer class once, working 6 hours, class 4 hours. . .I couldn’t keep up with the reading and homework, and I dropped the class in three weeks. And I’m no slouch, I already have two undergrad and a grad degree. I worked all throughout university (2 jobs one semester before studying abroad!) and had worked from 16 til now. I still had student loans because the jobs I could get in a state with a horrible (and getting worse) economic outlook did not cover the cost of rent, food, books, transportation, and supplies. Bear in mind that I only budgeted $20/week for food and cooked more food than I do now. Granted, I was lucky enough to survive on this piddling amount of income to pay off my student loans in 15 months after landing a job $6k below the national average for the job title, but I got laid off months later and have been back to square one ever since. I make a fraction of the hourly rate I once did and have no benefits. Ha – I’d love if it my kid could find full time employment. Currently all she could get is a part time job with very poor hours. Here’s hoping she eventually gets a better job. Maybe you could write an article about how poor and uneducated people have a hard time keeping up. I would love to finish my degree, but I find it hard to work 30 hours and week and go to school part time. It is hard for me because I didn’t come from an educated background. I honestly do not know what my background has provided me when it comes to life. So here I am, trying to make a life for myself, and I feel like I cannot do it all. You really need to have enough money before going to college in order to avoid yourself to be tempted in applying for some loan. There are a lot of students who did this kind of thing and until now, they are still facing on huge debt and doesn’t able to use their compensation from their work because they still need to pay their loan before. 9 Pings/Trackbacks for "It’s impossible to work your way through college nowadays"